Quick action needed to avert open civil war–style clashes. I’ll be posting updates to this blog post during the day. UPDATE 2:15 pm: The death toll in the shooting early this morning outside the Republican Guard headquarters has risen to 51, with 435 injured. "The Muslim Brotherhood are adopting a very dangerous attitude. They are insisting on escalating the situation," said Hassan Nafaa, professor of political science at Cairo University. He branded the Brotherhood leadership "extremists" and called on the moderate wing within the movement to pressure them into restraint. "Emotions are very high, and there is real anger on the streets," Nafaa warned. Other analysts, quoted in the same report, warn that extremists may turn to terrorism if the situation isn’t calmed by Egypt’s fractured political leadership now. It would a conflict that the Muslim Brotherhood would likely lose, but with massive casualties. The United States on Monday called on Egypt's military to exercise "maximum restraint" after dozens of people were killed while demonstrating against last week's ouster of president Mohamed Morsi. "Egypt's stability and democratic political order are at stake," State Department spokeswoman Jen Psaki told reporters during a briefing in which she said Washington "strongly" condemns violence on all sides. UPDATE 11 am: No doubt, later today the White House and the State Department will condemn the massacre in Egypt and call on all parties to avoid violence. But is there anything, really, that the Obama administration can do? The White House may or may not agree with John McCain and others, on both sides of the aisle, who’ve called for the United States to cut off aid to Egypt’s military. Cutting American military aid to Egypt would be useful sign that the United States doesn’t support continued rule by the armed forces, but in fact Washington has little leverage. Nearly all of the aid promised in 2013 has already arrived, so a cut-off of aid to the army now would apply to FY2014. Plus, Egypt can appeal to the conservative Arab states of the Persian Gulf to financial assistance, and it seems that Saudi Arabia, the UAE and Kuwait—but perhaps not Qatar, which lavished billions on post-Mubarak Egypt but supported the Muslim Brotherhood. Behind the scenes, the United States can lobby the armed forces command in Cairo, but there’s no guarantee they’ll listen. President Obama convened a secure conference call with the National Security Council today to review the very fluid situation in Egypt. The President condemned the ongoing violence across Egypt and expressed concern over the continued political polarization. He reiterated that the United States is not aligned with, and does not support, any particular Egyptian political party or group. In line with that position, the United States categorically rejects the false claims propagated by some in Egypt that we are working with specific political parties or movements to dictate how Egypt’s transition should proceed. We remain committed to the Egyptian people and their aspirations for democracy, economy opportunity, and dignity. But the future path of Egypt can only be determined by the Egyptian people. During this transitional period, we call on all Egyptians to come together in an inclusive process that allows for the participation of all groups and political parties. Throughout that process, the United States will continue to engage the Egyptian people in a spirit of partnership, consistent with our longstanding friendship and shared interests—including our interest in a transition to sustainable democracy. We urge all Egyptian leaders to condemn the use of force and to prevent further violence among their supporters, just as we urge all those demonstrating to do so peacefully. As Egyptians look forward, we call on all sides to bridge Egypt’s divisions, reject reprisals, and join together to restore stability and Egypt’s democracy. The United States is monitoring the very fluid situation in Egypt, and we believe that ultimately the future of Egypt can only be determined by the Egyptian people. Nevertheless, we are deeply concerned by the decision of the Egyptian Armed Forces to remove President Morsi and suspend the Egyptian constitution. I now call on the Egyptian military to move quickly and responsibly to return full authority back to a democratically elected civilian government as soon as possible through an inclusive and transparent process, and to avoid any arbitrary arrests of President Morsi and his supporters. Given today’s developments, I have also directed the relevant departments and agencies to review the implications under U.S. law for our assistance to the Government of Egypt. The United States continues to believe firmly that the best foundation for lasting stability in Egypt is a democratic political order with participation from all sides and all political parties—secular and religious, civilian and military. During this uncertain period, we expect the military to ensure that the rights of all Egyptian men and women are protected, including the right to peaceful assembly, due process, and free and fair trials in civilian courts. Moreover, the goal of any political process should be a government that respects the rights of all people, majority and minority; that institutionalizes the checks and balances upon which democracy depends; and that places the interests of the people above party or faction. The voices of all those who have protested peacefully must be heard—including those who welcomed today’s developments, and those who have supported President Morsi. In the interim, I urge all sides to avoid violence and come together to ensure the lasting restoration of Egypt’s democracy. In the end, however, what happened to Morsi is not about democracy per se. In Egypt, as far as I know (and I’m no scholar of Egyptian constitutional law!) there is no easy mechanism to impeach a president. In the United States, were a president to overreach as Morsi did, and seek to rule virtually by decree, he’d be impeached by Congress. In Egypt, especially following decades of military rule and one-man authoritarian regimes (and, before that, a king), it’s hard to install instant democracy—and when an election is held and the president abuses his position, is there any recourse for the opposition? Last week, we found out. UPDATE 10 am: The reaction by Egypt’s new president, a former judge named Adly Mansour, just isn’t good enough. Egypt’s presidency has ordered the formation of a judicial committee to investigate the clashes that took place in the early hours of Monday between supporters of deposed president Mohamed Morsi and the armed forces. Reports from the scene of the killings, in which more forty died and 300 were injured, aren’t clear yet. But there doesn’t seem to be any proof that an armed assault on the headquarters was underway. ORIGINAL POST: Before Monday morning, Egypt had a choice: political reconciliation or incipient civil war. With the massacre of Muslim Brotherhood supporters outside the Republican Guard offices on Monday, where supporters of deposed President Mohammed Morsi believe he is being held, Egypt is now headed toward the latter choice. 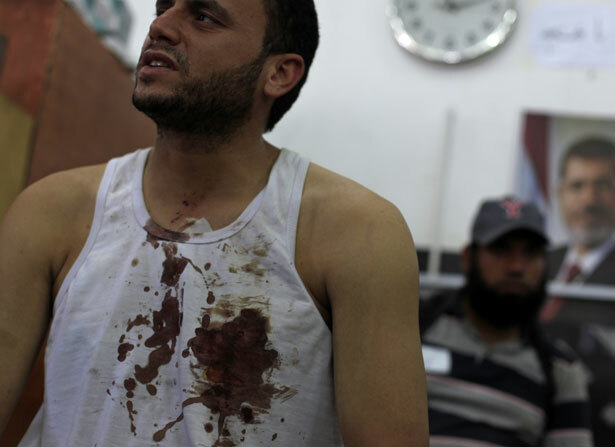 Dozens were killed and hundreds wounded by gunfire. The people who filled the streets to demand Morsi’s ouster may have only days, or hours, to avoid that outcome. Unless the perpetrators of the slaughter, apparently military and police officers, are fired, arrested and put on trial, and unless the military—having gotten rid of Morsi, who’d abused his position—take a back seat to the civilian, anti–Muslim Brotherhood majority, then the prospects for Egypt are horrific. The massacre, which reportedly took place in the dark, killed Muslim Brotherhood members who had just finished praying. Until that moment, it might have been possible for the military to cede power, as quickly as possible, to the civilians and schedule elections. Unless the senior military command moves quickly now, and unless the civilians condemn the killings outright, the alternative is that the army and the police—which, early on, openly backed the anti-Morsi protesters—will now confront backers of Morsi in armed confrontations in the streets of Cairo, Alexandria and other cities. Egypt is not Syria, of course. Unlike Syria, split into hostile sectarian and ethnic blocs, Egypt is a far more homogeneous nation, which reduces the likelihood for civil war. And Egyptians have far fewer guns available to the population than say, Iraq or Yemen. But Islamists outside Egypt will rally to the cause of the Muslim Brotherhood. Until the shootings on Monday morning, Egypt was relatively quiet, with only peaceful demonstrations by various sides, unlike the earlier—but far more limited and scattered—violent clashes last Friday. Want more Nation reporting on Egypt? Last week, Bob Dreyfuss live blogged the the fall of Morsi.